Although the ancient Romans went for them in a big way, most folks today don't know what to make of this superbly scented — but in its raw form, basically inedible — fruit. An inspired suggestion from British food writer Kate Whiteman: shove one in your glove compartment to deodorize your car. (Now there's an idea for the New York City Taxi & Limousine Commission.) An even better one comes from Andrew Carmellini circa his Cafe Boulud days: gently poach with honey and spices and serve as a sweet-tart accompaniment to wild game, pot roast, or pork chops, or simply spread on toast. Cut the quince into 12 wedges and place in a large nonreactive bowl. Add the juice of 1 lemon and enough water to cover. In a large pot, combine 2 quarts water with the remaining lemon juice, quince peels, wine, honey, star anise, and cinnamon. Bring to a boil and reduce the liquid by half, then strain through a mesh sieve, discarding the star anise, cinnamon, and quince peels. Return the liquid to the pot. Drain the quince wedges, add them to the pot, and bring to a boil. Cook the quince over medium heat until tender, about 10 minutes. 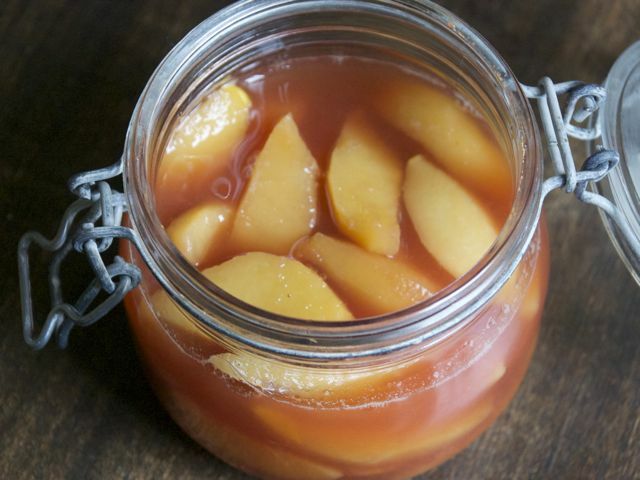 With a slotted spoon, transfer the quince to a large nonreactive container. Bring the liquid in the pot to a boil and reduce until it reaches a syrup-like consistency. Stir in the rose water and pour the syrup over the quince. Let cool to room temperature, cover, and refrigerate.